Ross Blake is a high-energy trainer and skilled consultant in Conflict Resolution, Progressive Discipline, and Performance Appraisal applications. Ross teaches skills and techniques based on solid experience, not theories. 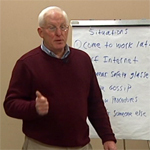 His practical approach has helped thousands of managers and supervisors resolve simple and complex situations at all levels. His new book, "How to Give Performance Feedback and Resolve Resistance You Knew You Were Going to Get," helps managers and supervisors learn how to give feedback the way they want to receive it. View the Ross Blake's Coaching and Feedback Skills course outline. View all Management and Supervisor Courses. Saving a minimum of $90K in turnover expenses by mediating a dispute between two IT professionals and successfully retaining both managers. Resolved department conflicts that had been resulting in turnover, transfers, low morale and diminished productivity by adjusting the work behaviors of the manager. Defeating a union vote by eliminating issues between warehouse management and employees. Reducing problems reported in an employee survey by delivering communication and leadership skills training. Ross Blake’s hands-on experience is complemented by his education and training. In addition to his Ohio University bachelor’s degree and graduate-level coursework, he is certified to conduct DISC and Leadership Effectiveness Analysis instruments. He is an energetic, hands-on trainer with the ability to develop tailored programs based on unique client situations and business objectives. Using his interactive training style, he excels at encouraging and addressing questions and situations that arise during training to help participants develop solutions and directly apply what they are learning. His participants learn by discovery and by directly using skill-based training, not by hearing and watching PowerPoint lectures. Ross’ executive coaching expertise assists clients in resolving workplace issues and obstacles, increasing open communication, improving manager-employee relationships and furthering information sharing. As a result, he helps get more corporate, management, and employee needs and expectations met.